Solution A: (Windows 7 & Windows Vista users): Right click on redsn0w.exe and then click on “Properties”. Switch to “Compatibility” tab and make sure you check “Run this program in compatibility mode for: Windows XP (Service Pack 3)”. Now simply start the application by right clicking on the .exe file and then click on “Run as administrator”. Solution B: If “Solution A” doesn’t work for you then make sure that you downloaded the correct firmware version file for your device. Solution C: If “Solution B” doesn’t work then try this when you are stuck on “Waiting for reboot”: Press and hold both the “Power” and “Home” buttons for about 10 seconds then release only the “Power” button only while continue to hold the “Home” button for another 10 seconds. Your process should continue now. Make sure you have kept all these files in one location under same folder. Solution B: redsn0w may crash for some users running Windows Vista & Windows 7. To get around freezing and crashing of redsn0w, right click on redsn0w.exe and then click on “Properties”. Switch to “Compatibility” tab and make sure you check “Run this program in compatibility mode for: Windows XP (Service Pack 3)”. Now simply start the application by right clicking on the .exe file and then click on “Run as administrator”. This should solve your problem on Windows 7. Solution C: If both “Solution A” and “Solution B” didnt work for you then try this(Thanks to joey): Choose not to install “Icy” when redsn0w gives you an option to install it. You can install “Icy” manually later when your are done with the jailbreak by following instruction under “Fix for Problem 5”. Solution A: You must make sure that you are updating from 2.2.1 in unlock and jailbroken condition. Solution B: You must also make sure that you connect your iPhone directly to usb port on the backside of the computer. Avoid using usb ports in front and usb hubs. Most importantly you will have to set your iPhone into DFU mode NOT recovery mode, i tried recovery mode and got an error. I’m sure most of you out there are just hitting shift + restore in iTunes and hoping it will work. But that method doesn’t set the phone into DFU mode. 1. Connect your iPhone and Press the home button for 5 seconds. 2. Press sleep/wake button for 10 seconds (do not release home). 7. Double click it and iTunes will start restoring. 8. Once that is done iTunes will say INVALID SIM (if you are not using the legitimate SIM card). 9. Now you have a choice, you can either set the phone back into DFU mode (remember NOT recovery mode), or jailbreak using quickpwn 2.2.5 (old version). I decided to jailbreak so that the “restore” option appears like how it is normally suppose to when you connect your iPhone. although setting the device back into DFU mode should also work. 10. Again press and hold shift and click on restore to browse to the custom “cooked” 3.0 firmware. IMPORTANT REMINDER: Recovery mode can also be activated by holding the sleep and home button for 10 seconds, then releasing the sleep button while holding the home for additional 30 seconds… THIS IS WHAT U ***MUST NOT*** DO!!!! Remember that throughout the process we are using DFU mode (I am emphasizing on this fact simply because recovery mode did not work for me). The shift + restore method was not functioning as it was suppose to. So if you face the same problem, tell me. i will show you how to bypass that. Those of you who have updated to iPhone OS 3.0 (jailbroken) might have noticed that your jailbroken apps (Apps installed outside from App Store) have stopped working. Even if you have tried reinstalling them they wont work because these apps require a patched version of MobileInstallation file on your iPhone. To get around this issue, follow the guide here to patch the MobileInstallation file on your iPhone to get all the jailbroken apps working on your iPhone with OS 3.0. 1. Go to “My Computer” in Windows. 2. 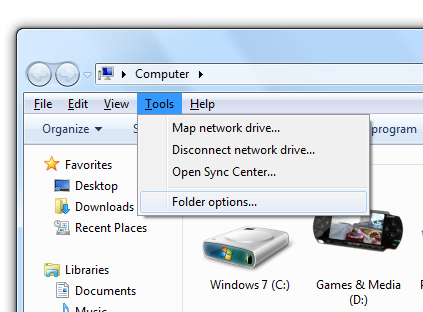 Press “Alt” button on the keyboard and then select “Tools” from the file menu and then click on “Folder options…”. 3. 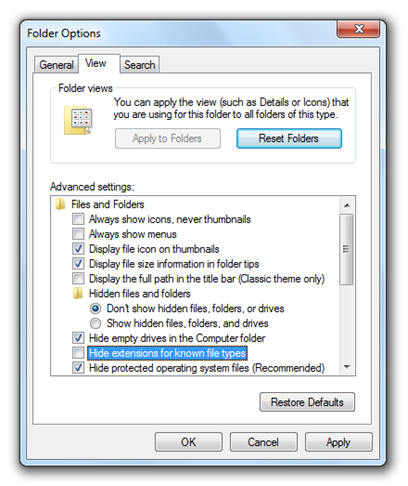 In “Folder Options”, switch to “View” tab and uncheck “Hide extensions for unknown file types” and then click ok.
Windows should now be able to read the file as valid “.ipsw” file for iTunes. UPDATE 1: redsn0w 0.7.2 is now available for both Windows & Macs. It adds support for PPC and comes with Icy(formerly Installer) as pre-installed. Direct Download links can be found here. Please share if you know solution to any problem that you may have encountered. Also let me know if any of these solutions fixed your problem. I’m open to any questions. Cheers! My problem now is every time i connect to iTunes I have no longer have the option to restore or anything else apart from itunes wanting to reconnect to the server. Is there anything I can do – ive tried repeating the pwnage both 3.1 & 3.0 but itunes still doesnt give me the option to restore – Ive even tried different computers & older versions of itunes ie 8.2 but still no option that allows me to restore using the custom restore files pwnage tool created . I would really appreciate a little of your time on this – is there anything i can do ? I'm having the same problem here. I have a jailbroken iPhone 3GS and clicked on the reset button (I had cydia and appsync installed, along many hackd apple api's). Now I'm stuck on the apple logo. Not even iRecovery would solve it. when I try to re-jailbreak it it keeps showing “waiting for nand” msg. Can Any one help us? Will it support the latest OS 3.0? Pl. give me advice .